Project Camelot is based on an idea generated when Kerry Cassidy and Bill Ryan met and spent the weekend in Tintagel, England, overlooking the sea in the home of King Arthur. Inspired by the legend of King Arthurand the Round Table a Utopian vision for the future, we decided to combine our talents and named our project in tribute to this vision. In 2012, TruTV released the long awaited Project Camelot TV pilot shot in 2010: SHADOW OPERATIONS: THE MARS PROJECT starring Kerry Cassidy and Bill Ryan and several of their whistleblowers and researchers. For those who missed the Live Broadcast on TruTV the show has been uploaded to Youtube and can be viewed on the Project Camelot Youtube Channel: https://www.youtube.com/user/jagbodhi. 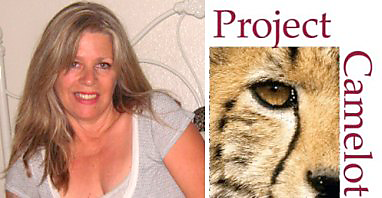 Kerry Lynn Cassidy is the CEO and co-Founder of Project Camelot. She is a documentary filmmaker and investigative reporter and in April 2006 she teamed up with Bill Ryan and founded Project Camelot. For the past 9 years, Kerry has been traveling the world conducting interviews and documenting the testimony of whistleblowers with above top secret clearances as well as authors, researchers and experiencers covering conspiracies, the secret space program, black projects, ETs and free energy. As an intuitive, and remote viewer, Kerry has spent years researching the occult and studying Eastern philosophy. While spending dedicated time in meditation, she linked her chakras in her 20s and has had multiple samadhi experiences since then. Kerry pioneered the now infamous Camelot guerilla interview style that captures the drama of the the interpersonal dynamic between interviewer and interviewee as well as an approach that enables the viewer to determine whether the truth is being told, some facsimile thereof, or a lie. Kerry Cassidy is a well known radio talk show host of Camelot Whistleblower Radio now on Livestream.com, and speaks at conferences around the world. She has produced several highly regarded conferences with the trademark name Awake and Aware featuring key witnesses and researchers that are part of the Camelot history of interviews. KERRY'S BLOG has gone viral and become a must see news commentary space picked up by alternative news organizations around the world. Kerry's weekly radio show, Camelot Whistleblower TV is now on Wednesday and Thursday nights from 7pm PT to 9pm. Over the past 6 years her radio shows have generated millions of listeners. The Project Camelot Youtube Channel has over 109,000 subscribers and the Camelot videos generate millions of viewers. At this time, the Project Camelot library contains 400+ hours of audio and video footage available free online. Kerry pioneered the Project Camelot LIVE Roundtable discussions broadcast on the Camelot Livestream Channel involving top researchers, whistleblowers and authors where ideas, theories and evidence is shared and analyzed. Kerry has a BA in English from Sonoma State University, and is a graduate of the UCLA Anderson School of Management Executive Program as well as a specially selected author-writer-director of the UCLA Short Fiction Film Program. She worked for 19 years in Hollywood for top studios, talent agencies and in independent film production and development, prior to founding Project Camelot.